On the Edge of the Dark Sea of Darkness is not quite a normal fantasy novel. After all, the bad guys are so clearly bad, the fantasy names come off as contrived (The fangs of dang? Really? ), and the book is just so whimsical. I love Andrew Peterson’s music, but one chapter in I wasn’t convinced that his writing was any good at all. 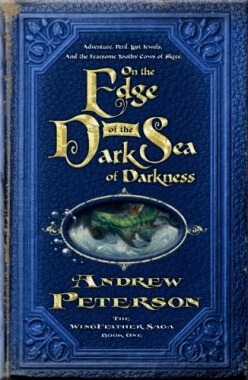 Thankfully, I kept reading — and let me tell you, On the Edge of the Dark Sea is well, well worth the read, and holds much more under the surface than its whimsical beginning promises. Much like The Chronicles of Narnia, The Wingfeather Saga is a children’s series. It’s a light, and a little fluffy — definitely not epic like Lord of the Rings. It’s a bed-time story, meant to be read aloud to your children each night. Luckily for fantasy lovers, there’s more than enough room for the saga even alongside bigger siblings like Lord of the Rings. Since it’s a children’s book, On the Edge of the Dark Sea of Darkness (or OTEOTDSOD for short) is about children — the Igiby children — Janner, Tink, and Leeli, to be specific. The Igibiys live in the land of Skree, which has been conquered and overrun by the fearsome lizard-men (fangs) of Dang. Though they have been conquered, the Skreeans still remember the Great War and the legendary tales of the land of Anniera. It’s rumoured that the prized Jewels of Anniera are hidden somewhere in the land of Skree. But all is not well, for Gnag, chief of the dangs, has demanded the jewels at any cost, and all the good lands of Skree are in danger. In the midst of all this, the Igiby children are quite unexpectedly swept up into the mad rush to save and hide the Jewels of Anniera. OTEOTDSOD is the very best kind of children’s book. It’s delightful to read, and the light, funny tone masks a gripping and entertaining story. Plot twists abound: there is much more to the Igiby children and Skree than first meets the eye. I found myself reading quicker, eventually finishing the last half of the book in one sitting. I can’t wait to read it to my kids — more to the present, I can’t wait to buy the second! Andrew Peterson has managed to weave not only a good plot and a charming tone into the book, but also hidden undercurrents of truth. Like C.S. Lewis, Peterson “…gives us at once an imaginative experience and relates truths of the most important kind.” (Wayne Martindale, Beyond the Shadowlands). One excellent theme that runs throughout the book is Janner’s manhood. It’s a story, yes, and Janner’s development proceeds to match the plot and pace, but even on a deeper level the story communicates real truth about what it means to be a man. This is definitely a message that we could hear more of in today’s culture. And OTEOTDSOD is full of these truths that run parallel, deeper than the story. Much like Narnia, the beauty of the Wingfeather Saga is that children will learn to love them for the story, but then by the story fall in love with the truth underneath. I loved reading the first book in Andrew Peterson’s series (just in time for the last one to launch), and I’m eagerly awaiting the second one. I highly recommend these books, not as Narnia lookalikes, but as their own unique stories with value, delight, and wonder packaged inside. I love these books! The first book is such a great opening and they only get better from there. On the edge of the Dark Sea of Darkness – Such a great story! 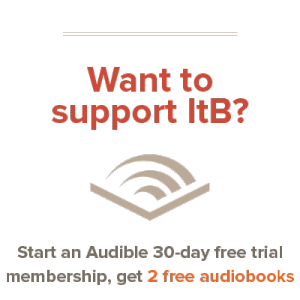 North or be Eaten – A very good follow up, characteristic second book. Monster in the Hollow – The story really starts to kick in here! The Warden and the Wolf King – Such a wonderful ending to the series! Finished it in one sitting. Ah. Such a great story all through them till the very end!